Sydney Zirkle of Wauseon hits one over from the left side Thursday at home versus Napoleon in a Division II sectional final. She recorded 16 kills as the Indians won in three sets. 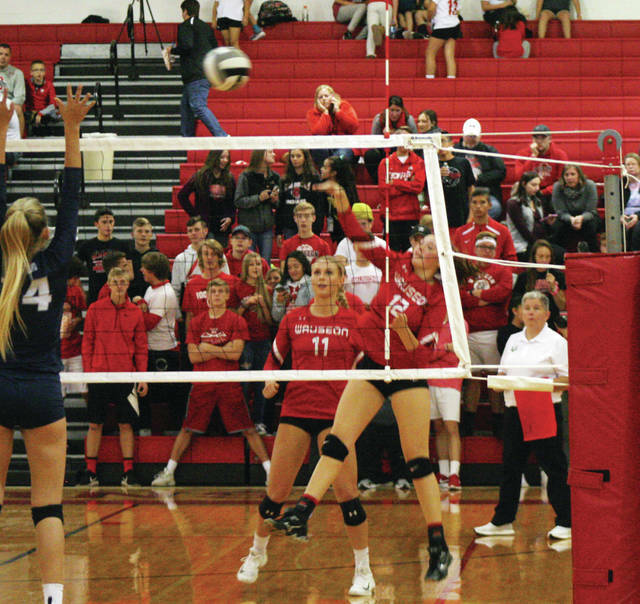 The top-seed Wauseon Indians welcomed 11th seed Napoleon Thursday where they outlasted the Wildcats 25-20, 25-17, 25-14 in a Division II volleyball sectional final. The opening set seemed to be a synopsis of how the match would go. Wauseon had to stave off several Napoleon runs en route to getting the win. The Wildcats led early, but the Indians went on a 12-1 run in the middle of the set to take control. Chelsie Raabe started the rally with a shot from the middle, then a Kelcy Blanchong ace and four Napoleon errors gave the Indians a 13-9 lead. The teams then traded errors, Sydney Zirkle added three straight kills, and another Wildcat miscue extended Wauseon’s lead to eight. However, Napoleon responded with a 10-0 run of their own. Kills by Erica Sickmiller, Anna Mack (2), Maddie Jones and two aces from Taylor Strock helped them gain a 20-18 lead which forced a Wauseon timeout. Also included in that stretch was four Indian hitting errors. And come back they did, scoring the final seven behind the efforts of Zirkle, Maddie Trejo, and Sauber. The two teams went back and forth in the second game, with the Indians regaining the lead for good midway through. They broke a 13-all tie on Raabe’s block, then after a serving error, Zirkle fired two kills from the left side and Skylar Reckner added an ace to put them on top 17-14. Napoleon would get no closer than three points the rest of the game. In game three, the Indians tallied five aces as they pulled away with a 25-14 win to finish the sweep. Sauber finished with nine kills, three blocks and 21 digs for the Indians. Raabe added six kills and two blocks. Trejo and Tamera Smith had three kills apiece. Wauseon (18-5) now advances to the district tournament at Bluffton University. Tuesday they will take on Lima Shawnee in the first semifinal at 6 p.m.